In celebration of Women's History Month, I'm highlighting the achievements of Brenda Eichelberger and the National Alliance of Black Feminists. 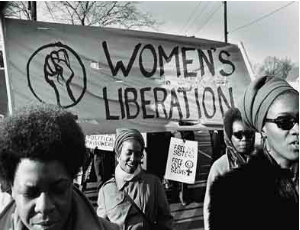 Open to “any black woman interested in advancing the cause of black feminism,” the National Alliance of Black Feminists was dedicated to achieving full equality for black women in America. Brenda Eichelberger decided to respond to an increase in local, national and international black feminist struggle by organizing the National Alliance of Black Feminists in summer 1975. She served as its first executive director. The organization opened its national offices in May 1976 at 202 S. State Street. Some of the goals of the alliance included promoting a more positive and accurate portrayal of black women in the media; preserving the cultural heritage of black women while helping to politicize them; and combating the dual oppression of racism and sexism. The organization addressed these goals through serving as a networking center for black women through the coordination of the Black Women’s Center; forming a Black Women’s Speaker’s Bureau; developing task forces to address women’s issues, with specific attention to the passing of the Equal Rights Amendment; and sponsoring consciousness-raising workshops. Other noteworthy activities included the compilation of “A Bill of Rights for Black Women” and the formation of the only Women’s Credit Union in Illinois. In addition to Brenda Eichelberger, the alliance's charter membership consisted of the Rev. Willie Barrow, national vice president, Operation PUSH (Learn more about the Rev. Barrow in our blog post Remembering Civil Rights Activist Rev. Willie Barrow. ); Carol Moseley Braun, later an Illinois legislator and U.S. senator; Yvonne Brathwaite Burke, attorney and Congresswoman from California; Ethel Payne, Chicago Defender associate editor. Chicago Public Library’s Vivian G. Harsh Collection of Afro-American History and Literature holds the Brenda Eichelberger/National Alliance of Black Feminists Papers. That finding guide, a detailed description of the collection, has more about Eichelberger and the alliance. Interested in learning more about women's history in the Harsh Research Collection? Join us Saturday, March 26 for a Women's History Month tour of the Harsh Research Collection, one of many Women's History Month events at CPL.